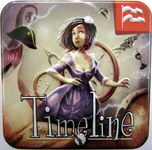 The latest in the Timeline series of games. How well do you know your history? Well here's your chance to find out and have find at the same time. Was penicillin discovered before or after the South Pole? Well here's your chance to find out and have fun too. Could Darwin have celebrated his theory of evolution with a glass of Champagne? Was the electric iron invented before or after the first human journeyed into outer space? To win this game, be the first to correctly place all your cards. Had Julius Caesar ever been appointed Emperor before the Great Fire of Tome occurred? Had the construction of the Great Wall of China already begun? Did the California Gold Rush take place at the same time? Could anyone wear blue jeans when the Encyclopedie was first published? Was the toothbrush already in use at that time? Was the seaplane invented before or after these inventions?